The War Memorial commemorates the 199 local men who enlisted during World War One, including the 21 who were killed in action and the 7 (including 1 aboriginal designated as such) who died in service. The memorial was erected by Mr Tom Mann with the help of the Committee while the 'digger' statue was the work of Petrie and Sons. 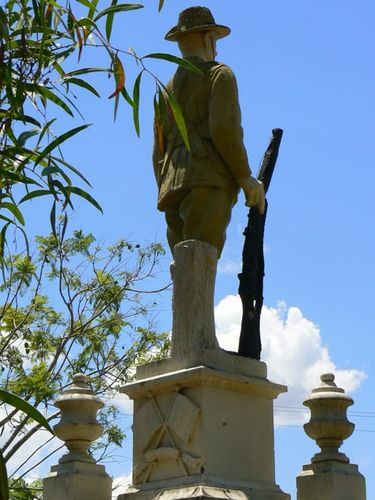 The memorial was unveiled by the Queensland Premier, Mr E.G.Theodore on the 3rd May 1922 who stated at the ceremony that more Australians had fallen in the war than Americans, Canadians and even Belgians. Cairns Post (Qld), 4th May 1922.